The holidays are filled with parties and potlucks and can often feel like a burden on your health. While there’s really no getting around the fact that alcohol is added calories, you shouldn’t feel guilty for enjoying a few drinks over the holidays. If you’re looking to make your holiday cocktails a little bit healthier (and sustainable), take a look at some of my favorite drinks for the holidays that won’t make you feel like you need to restrict yourself to a diet by the time January 1 rolls around. 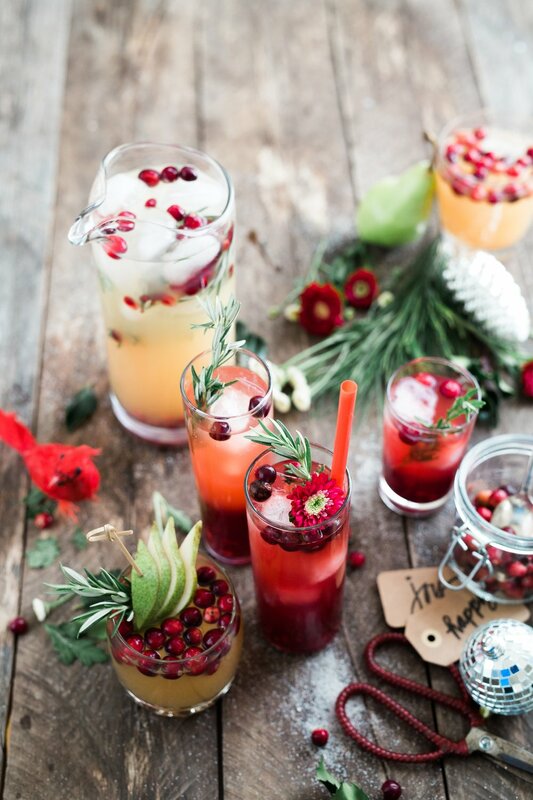 One thing to keep in mind when creating a healthy holiday cocktail is to keep things simple. Unless you’re adding water or herbs, the more you add to the drink the more likely you’re upping the calorie and sugar count. I come from a small business family and I love nothing more than to support other small businesses, especially during the holiday season. I’ve added a “make it local” bit to each cocktail. If you live in the DC area, consider giving these local businesses a try over the holidays! Photo by Dishing Up the Dirt. In the fall and winter, bourbon is definitely my go to drink of choice. Warms you from the inside out! Well, the name of the drink says it all. Cranberries are rich in vitamins and antioxidants. 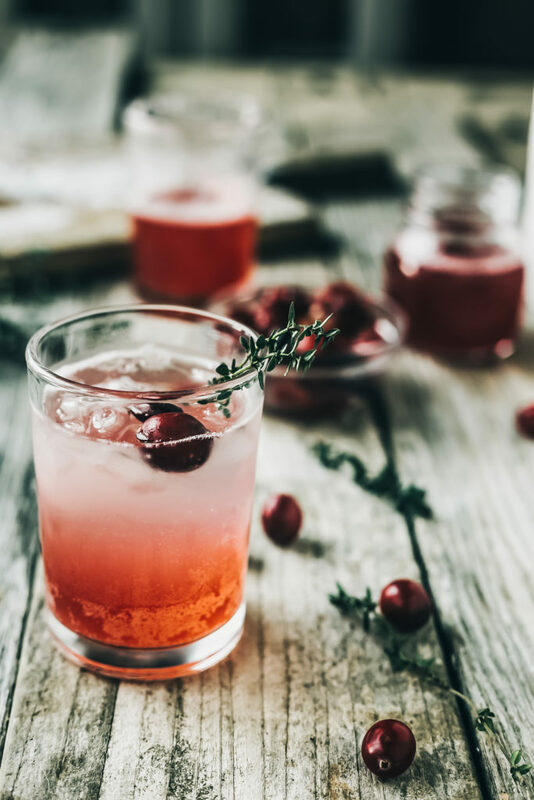 When making the simple syrup, I love to add the cranberries back into the drink or blend the syrup in a blender to keep all of the nutrients in the syrup from the cranberry fruit and skin. Moving along to the ginger, this world famous root can aid in soothing an upset or nauseous stomach (hello hangover remedy!) and also has anti-inflammatory properties. Grab a jar of local honey in your area -- supporting local business and sipping in a few health benefits while you’re at it. Fill each cocktail glass with a little ice, an ounce of bourbon and 1-2 Tablespoons of the simple syrup. Top with soda water and serve. Like I said, keep it simple. This delicious winter cocktail has as few as four ingredients and warms you with a bite of spice from the ginger beer. It’s lower in sugar and made with simple ingredients. With this cocktail you can vary the amount of alcohol or sugar by adding less vodka or less ginger beer. K&B Ginger Brew - They have a couple of variations of the Mule on their website! This drink will make you feel like you’re on a beach in the Caribbean. Who doesn’t want to feel all warm and fuzzy in the dead of winter! A mojito keeps things simple but beyond that, mint is a calming and soothing herb that can aid in digestion. After eating all the holiday treats, this drink may help you (and your stomach) feel less like a digestive trainwreck. Grab some fruit (++ if it’s organic!) from your local farmer’s market to muddle into your drink. DC's Dupont Circle Farmer's Market is open year round. Besides the ginger, sage, and delicious fruit in the cocktail, this cocktail wins my approval for being healthy(ish) because you can dilute the amount of alcohol you’re drinking with water, soda water, or fruit. This is a nice refreshing cocktail that can take you through the evening. Maryland native Old Westminister Winery is woman-owned and practices sustainability. Their wines are only sold online and at the farm, so for more suggestions, head to H Street’s new natural wine bar, Dio. In a saucepan, combine the honey and water over medium heat and bring to a light boil. Turn the heat down to low and simmer, stirring occasionally, until the honey has dissolved completely. Add the pears, ginger and sage leaves. Simmer until the mixture has reduced by 1/3. About 15-20 minutes, stirring occasionally. Remove from heat and let the mixture steep for an additional 10 minutes. Strain the syrup into a large mason jar. Discard the ginger and sage leaves. To assemble the drinks place a few pieces of the cooked pear into each glass followed by 1-2 Tablespoons of the simple syrup. Add the champagne and enjoy. This makes more simple syrup than you'll need for 4 cocktails. Save extra simple syrup in the fridge and enjoy over ice cream or even in smoothies. Looking to amp up a few of your own cocktails through the holiday season? Think about adding in kombucha or Switchel as the cocktail mixer. Speaking of...check out our fellow Union Kitchen gals over at Sip City to learn WTF Switchel is and why it’s the next big bev on the market. Not into booze? This article from Mind Body Green has delicious, alcohol-free cocktails to get you through winter!